It didn’t have to come to this. He could have died in that motorcycle crash or been shot by a crazed fan or sky-walked out a 10th-story window during a bad trip. But Bob Dylan–the great American artist of the past 50 years, I believe–survived, which is perhaps the only prosaic thing he’s done in his life. A half-decade older than the oldest baby boomers, 68 on May 24, he has predicted their maturation–marriage, divorce, finding and losing religion, midlife crisis and regeneration, a second wind, a third. 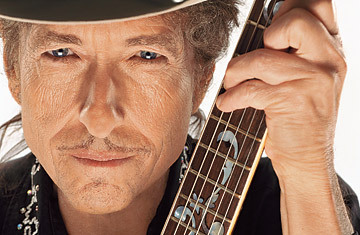 And now, with the release of his 46th album, Together Through Life, Dylan is, officially, old. Listening to these songs, I imagine him as one of the last guests at someone else’s 70th-birthday party, sitting at a table that’s been cleared except for the wine stains and bread crumbs. He’s wearing a bolo tie and his scraggly mustache, telling stories about women he used to know but never cared for all that much. Actually, Dylan announced the onset of his seniority in 1997 with the excellent Time Out of Mind, a dark and wistful album that looked backward more than forward, his voice a nasal husk of itself, accessible only to his most persistent fans. There was a high-tech hipness to Time Out of Mind–the damp, echoey sound provided by producer Daniel Lanois–that doesn’t exist on the new album. Everything about Together Through Life is simple: the lyrics , the instrumentation and the sound, which Dylan admits, in an interview posted on his website, is an homage to the Chess records of his youth. “I like the mood of those records–the intensity,” he says. “The sound is uncluttered. There’s power and suspense. The whole vibration feels like it could be coming from inside your mind. It’s alive. It’s right there. Kind of sticks in your head like a toothache.” Well, power and suspense … in a sad, languid way: the power of a sunset, the only suspense the shock you feel when it suddenly slips away, casting strawberry light on the outline of distant clouds. It is now apparent that there has been a narrative arc to Dylan’s career. He started obvious, then exploded surreal–each new album a surprise of some sort–and is now back to being obvious again. He began as a tribute act: Woody Guthrie reinvented, down to the studio photos in which he pooched his lips like Woody and held his guitar the same way. On his first, eponymous album, Dylan sang mostly other people’s songs–except for one talking blues and the haunting “Song to Woody,” which was an exercise in folk classicism. He wrote new lyrics to the tune of Guthrie’s “1913 Massacre,” just as Guthrie had applied his lyrics to the ancient ballads he’d learned from his mother. The old lefty folk community embraced Dylan even as he quickly surpassed Guthrie, writing his own music to go with his brilliant lyrics to protest the atrocities of the 1960s, songs like “Blowin’ in the Wind” and “A Hard Rain’s A-Gonna Fall.” But four-chord, straight-ahead folk music proved, well, boring after a while, and Dylan betrayed the folk pedants by going electric–“Judas!” they cried in England–and the ideology-encrusted hard-liner Pete Seeger tried to pull the plug on Dylan’s breakthrough performance at the 1965 Newport Folk Festival.